The interior is decorated with mirrors and green wood panels, with green velvet seats and marble tables. 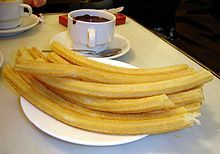 The hot chocolate is served in Spanish style - thick, dark and strong - and the churros - deep fried batter, similar to a light, crispy, linear doughnut, cut to length by the staff - are served hot and freshly cooked, ready for dunking. In 2010, a San Ginés's branch was opened in Shibuya, Tokyo (Japan). It closed one year later, in 2011. Wikimedia Commons has media related to Chocolatería San Ginés. This page was last edited on 20 October 2017, at 16:31 (UTC).